Participants : A. Seuret [Contact person] , C. Briat [Royal Institute of Technology] , J. Gomès Da Silva Jr. [Univ. Federal do Rio Grande do Sul] , W Jiang, M.M. Peet [Illinois Institute of Technology] . NCS are controlled systems containing several distributed plants which are connected through a communication network. In such applications, a heavy temporary load of computation in a processor can corrupt the sampling period of a certain controller. The variations of the sampling period will affect the stability properties. It is now reasonable to design controllers which guarantee the robustness of the solutions of the closed loop system under periodic samplings. However the case of asynchronous samplings still leads to several open problems such that the guarantee of stability whatever the sampling period lying in an interval. In  and  , we propose a novel approach to obtain sufficient asymptotic and exponential stability conditions of linear time-varying systems. Those conditions are based on the continuous-time approach but are based on the discrete-time Lyapunov theorem. The proposed theorems provide larger upper-bounds of the allowable sampling period than the existing ones (based on the continuous time approach). An additional characteristic of this framework is that it allows considering in a simple manner uncertainties and non linearities in the model as saturation in the control inputs. In  we also consider the case of communication delays. This study on sampled-data systems will be used in the sequel to improve the performance of distributed algorithms. Participants : A. Seuret [Contact person] , J.-P. Richard [LAGIS] , E. Fridman [Univ. Tel Aviv] , J. Gomès Da Silva Jr. [Univ. Federal do Rio Grande do Sul] , K.H. Johansson [KTH] . A first contribution consists in developing novel type of tools able to assess stability of time-delay systems. In  and  , we develop a new type of Lyapunov-Krasovskii functional whose parameters are defined using an arbitrary linear differential equation. In  , we propose a method to design a memoryless state feedback control law which stabilizes neutral and delayed systems with saturated input. Concerning the stability of NCS under communication delays, we proposed in  ,  and  , to use a time-varying horizon predictor to design a stabilizing control law that sets the poles of the closed loop system. The computation of the horizon of the predictor is investigated and the proposed control law takes into account the average delay dynamics explicitly. The resulting closed loop system robustness with respect to some uncertainties on the delay model is also considered. Tele-operation subject to time-varying delays has been considered in  . In  and  , we also proposed an observer-based controller to ensure the stabilization of networked controlled systems. The main interest of such a controller concerns the potential to take into account the additional dynamics induced by the networks cited above. Further developments will take into account the quantification and the coding of the transmitted data packets. Asynchrony is becoming more and more meaningful in modern control architectures and some new control strategies are being developed by some research teams in the world. The principle of these control laws is to compute a new control signal only when some event occur, where an event characterizes a change in the system and therefore a need for a new control. These approaches are supposed to reduce the number of times the control signal is computed and to remove the hard real-time constraint on the computational system. In this domain, our contribution is twofold. First, based on previous result from Nicolas Marchand  , we proposed a fully asynchronous control scheme (without any time information) for chain of integrators that insures the global stability of the system with only measures when the states cross an a priori defined level. This work was presented at the IFAC world congress in Korea  . Secondly, we removed the safety limit condition introduced by K-E. Årzén in his event-based PID controller  . This safety limit was added to prevent the system to be sampled less than what Shannon theorem requires but we showed that the Shannon sampling condition is not consistent anymore in the context of event-based systems. This work is described in  and  . Participants : D. Simon [contact person] , O. Sename, E. Roche, M. Ben Gaid [IFP] . Control and real-time computing have been associated for a long time, for the control of industrial plants and in embedded or mobile systems, e.g. automotive and robotics  . However both parts, control and computing, are often designed with poor interaction and mutual understanding. 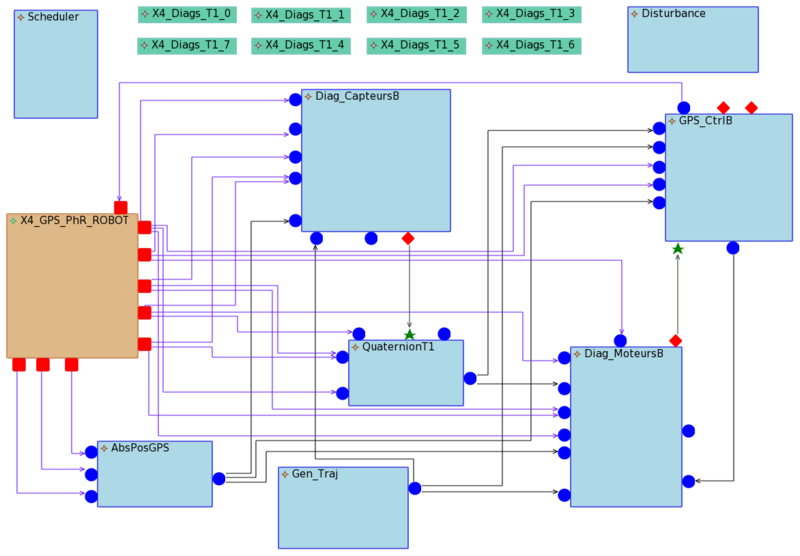 We propose here an Integrated control and scheduling co-design approach, where closing the loop between the control performance and the computing activity is promising for both adaptivity and robustness issues ( ). In the past years we developed a variable sampling control methodology based on the LPV (Linear Parameter Varying) framework and control synthesis, where the sampling interval is used as a known and controlled variable. 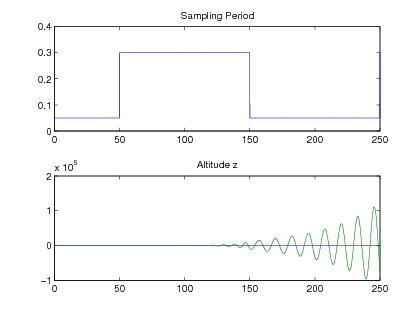 Few assumptions about sampling are needed for this control design : the main point is that the control interval is known and lies between the predefined bounds [hmin;hmax] , whatever the origin of the control interval variations, its speed and its frequency. The initial approach has been cleaned in  . Beyond the initial goal, where the control interval is assumed to be controlled and known, case study simulations show that the method has a good robustness w.r.t. unmodelled delays, such as latencies due to networking, computing and preemption activities ( ). Further work plans to specifically analyse, understand and exploit this robustness. However, the computational complexity of the initial approach, based on polytopic models of the uncertain system, is expected to grow fast with the number of uncertain parameters in the plant. A new formulation of varying sampling, in the framework of the LPV methodology, has been developed using a Linear Fractional Transform (LFT) where it is expected that the varying control interval and the plant's uncertain parameters can be both considered. The objective is to transform the system under the form described in Figure 14 where matrix represents the uncertainties depending on the sampling period h .
The varying sampling controller is synthesized using the LFT model, in the LPV/ framework by the resolution of LMIs handling both the nominal model, the uncertainties model and the control objectives ( ). Note that the weighting templates used in the control design are also made sampling dependent, to avoid a too high performance demand when the sampling rate is slow. Participants : D. Simon [contact person] , O. Sename, E. Roche, S. Varrier. In the framework of FeedNetBack projects, the LFT/ approach has been applied to the control of an AUV. The 3D coordinated control of an autonomous underwater vehicle is not straightforward : indeed the model of the vehicle has important non-linearities and several poorly known parameters which lead up to robust control. Moreover the limited capabilities of underwater acoustic links and limited embedded computing power and on-board energy induced serious timing disturbances and scheduling constraints. These problems make AUVs good testbeds for control/computing co-design. An LPV/LFT model of the AUV considering the sampling period as varying parameter, using the methodology previously described has been built. 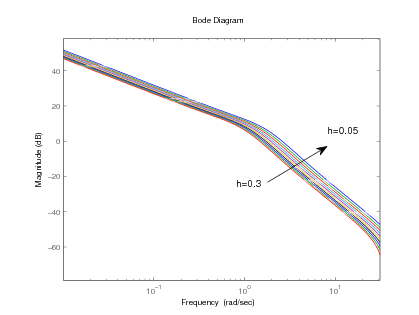 From the linearized model of the AUV, a discretized model according to a varying sampling rate is obtained thanks to a Taylor series expansion, where the parameter block as a direct dependence on the varying sampling period . 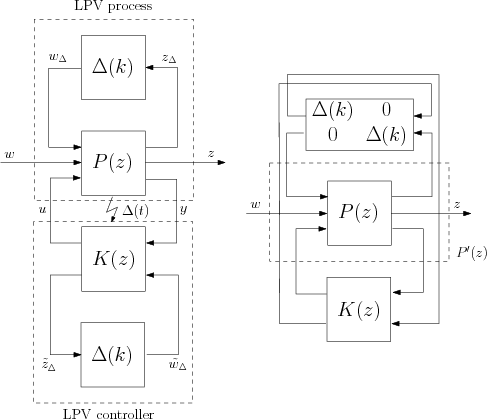 The Bode diagram of this LPV/LFT system (Figure 14 ) shows a variation on the system gain and also on the bandwidth according to the current value of the sampling interval. Simulation results show that this LPV/LFT controller provides stable control with performance compliant with the specification for all the desired range of sampling interval variation (while a pure fails to stabilize the system for slow sampling rates). 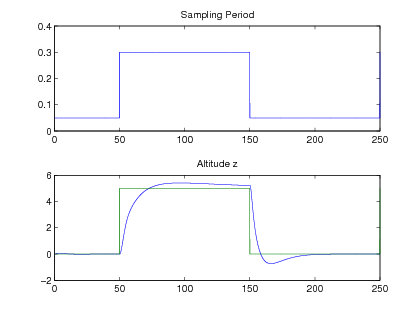 The classic way to design an altitude controller has been used considering a model representing the transfer between the desired output (altitude z) and the reference zref. Indeed this direct method does not well take into account the structure of the vehicle and particular actuators (front and rear fins). This leads to difficulties in the tuning of the control parameters, and does not allow to handle their limitations. Therefore an alternate kind of control has been developed  . It is a cascade structure, taking into account that altitude motions are basically the result of pitch angle variations. This cascade structure helps in control parameters tuning and easily allows for the introduction of anti-windup to fight actuators saturation. The application of LPV varying sampling for this enhanced cascade control structure is under investigation  . Participants : D. Simon [contact person] , R. Pissard [SED] , S. Arias [SED] , E. Rutten [SARDES] , F. Boudin. The observation and characterization of implementation-induced distortions on feedback controllers is usually beyond the capabilities of traditional simulation tools like Matlab/Simulink or Scilab. These lacks have motivated the deployment of a specialized toolbox, to integrate models of operating systems and networks inside control-dedicated existing simulation tools. As these tools provide modellers, they can be used for fast prototyping and problems spadework. However these approaches remain simulations and are still quite far from a real implementation. Another drawback is slow simulation speed, due to complex models involving a mix of continuous and discrete dynamics, that can be a handicap to study realistic scenarii. On another hand it appears that hardware-in-the-loop simulation (merging the real hardware/software targets and a simulated plant) is able to provide faster (real-time) simulations and is a useful last step before integration and tests on a real system. Orccad is an integrated development environment aimed to bridge the gap between advanced control design and real-time implementation. Although it has been developed years ago, the basic concepts upon which the Orccad architecture relies still appear to be solid in the field of software development for robot control  , it still compares well with other tools dedicated for real-time control implementation  and is expected to provide the missing link between simulations and experimentation  . In the framework of the SafeNECS ANR project, a hardware-in-the-loop experiments using Orccad has been set up to provide a safe environment for both algorithms and software validation, prior to experiment with the real (expensive and fragile) quadrotor. Figure 16 describes the control and diagnostic setup used for testing purpose  . For example it may be used to implement a (m,k)-firm dropping policy (  ) or hybrid priority schemes over the CAN bus  . To fullfill the control performance objectives together with safety and dependability contraints, the feedback control data flow must be linked with discrete event controllers, aimed to handle exception handling as well as complex mission programming based on elementary actions scheduling. This layer up to now uses programming and synchronous composition with the Esterel language coupled with formal verification tools. An alternative approach is currently carried out in collaboration with the Sardes team. Rather than using programming then verification, the new approach aims at using discrete-event control synthesis to build directly safe controllers from the system specification rules and control objectives  .